A cheque is one of the most popular financial instrument used for performing financial transactions. Although it is a very popular financial instrument yet many people are not aware of types of cheques and its importance. Recently I come across one incident where a person was not aware of “cancel cheque”. He was asking about “What is Cancel Cheque? & How to Cancel the Cheque?” I helped him in understanding about cancel cheque. So, if you are one of them and looking for information about Types of Cheques you are at right place. In this post, I will share complete information about Cheque and types of Cheques. A cheque is a form or negotiable instrument. Once you open a saving bank account, a bank will issue a cheque book which contains a number of cheques. A cheque is a document which guarantees the payment of a specific amount of money on demand to a certain person or to the bearer of instrument. You can use the cheque to withdraw deposited money or issue cheque in favor of person you want to transfer money. You need to write the name of a person, amount, date and sign on the cheque. The person needs to deposit the cheque to the banker. A banker verifies the signature and makes the payment. After going through a definition of a cheque, let’s take a look at 10 Types of Cheques. Bearer Cheque is cheque where word bearer is mentioned on the cheque and it is not crossed or made account payee. 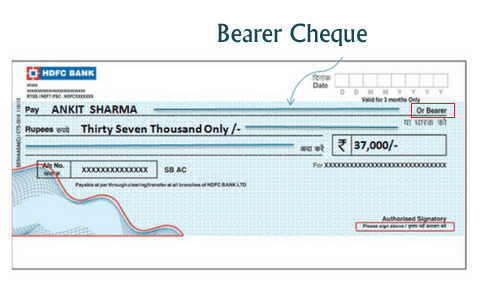 Bearer cheque is generally used of a cash transaction. 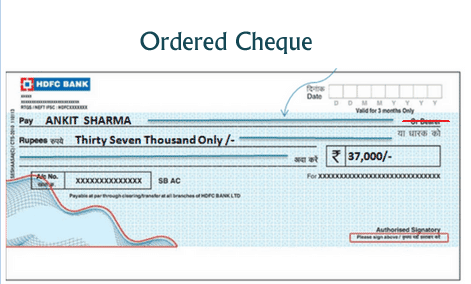 Bearer cheque can be encashed by the person specified therein or any other person who present it to the bank for payment. These types of cheques are risky in nature. Order cheques are cheques where word “bearer” appearing on the cheque is canceled and the word “or order” is written on the face of a cheque. Order cheque is payable to the person specified therein as a payee. The payee can transfer an order cheque to someone else by signing his or her name on the back of it. When a cheque is not crossed, it is known as an “Open Cheque” or an “Uncrossed Cheque”. The payment of such a cheque can be obtained at the counter of the bank. An open cheque may be a bearer cheque or an order one. A crossed cheque is one where two lines are made on the top right corner of the cheque. Amount mentioned on such cheque is only transferred to the bank account of the payee. No cash payment is made. Anti-dated cheques are one on which date earlier than current date is mentioned. Such a cheque is valid up to 6 months from the date of a cheque. If a cheque is issued with a date which is yet to come (future date) it is called as a post-dated cheque. These types of cheques are taken as a security deposit. If the cheque is produced to a bank after the validity period it is called as a stale cheque. No payment will be made by banks against that cheque. The cheque validity is three to six months. When a cheque is cut into two or more pieces and presented for payment, such a cheque is called a mutilated cheque. The bank will not make payment against such a cheque without getting confirmation. Account Payee Cheque is one where two lines are made on the top right corner of the cheque and “Account Payee” is written. Amount mentioned on the cheque is only transferred to the bank account of the payee whose name is mentioned on the cheque. No cash payment is made. Cancel cheque is one where two lines are drawn across cheque and the word “CANCELLED” is written inside the two lines. The Cancel cheque holds no monetary value. It cannot be used for transferring funds from one account to other. The basic purpose of Cancel Cheque is for KYC and for verifying bank account.